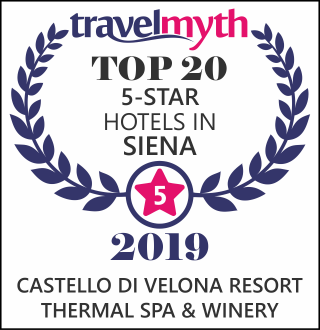 Why choose castello di velona? Your Perfect Place in Tuscany! At Castello di Velona you can choose between Castle Rooms and Unesco Rooms. "I stayed here at Castello di Velona for four nights in a Junior suite. It was kept as a surprise for the other half and well, it delivered beyond my expectations. I was expecting a nice room, yet still manages to exceed on what you’re to expect form this standard of room. An enormous bathroom which hosted a thermal bath. Meaning the water was from the natural springs which is what you will find in the castle spa and outside pool. I was sceptical when looking at reviews from over a year ago where the staff were constantly criticised for the lack of caring, I can honestly say, it is clear as day that the staff have since changed. Having a 3 hour cooking class with the head chef Bacciottini Riccardo, He made it clear that new staff and a new attitude towards how guests should be treated. The attention to detail with food and service was fantastic. Riccardo has experience working at the worlds number 1 restaurant in Copenhagen, Noma. If you know your food, can certainly expect great food dining here. If you are going to stay here i would recommend hiring a car, there isn’t much around other than spectacular views. Montalcino is 15 minutes drive away, beautiful town. It may come across as bias reading this, I’m sitting here trying to think of any negatives about this place and I just can’t. Ok 1 thing, the price of bottled water, pricey to say the least. But you can not stay here and expect a cheap get away. Could not recommend this place enough! Thank you to all the staff for making this trip unforgettable." "We stayed at Castello di Velona for one night in october and it’s an amazing hotel. The view is fanstastic, great breakfast with a great variety. The lounge and pool area is great. The only thing that brings our experience down is the dinner at their ”gourmet restaurant” Settimo Senso. We paid 350 euro for a three course dinner and it was really not worth it. The flavours were not balanced and the cooking was a bit outdated. I would advice guests to have dinner at the pool restaurant." "you have an amazing property and staff. We had such a great time. The only little thing that bothered me was that I had to pay for water. A place like yours should not be gouging people for 8E water. Other then that I would stay and recommend your place to any one. Thank you"
"Amazing location in very good condition and friendly staff!" Situated in the old part of the Castle, with a panoramic view of the Val d’Orcia and the surrounding vineyards, the 24 “Castle” rooms and suites contain within their walls a past going back hundreds of years. The Hotel’s wine and food offer fully satisfies the body and soul, both in the rustic Il Brunello in the historical part of the Castle, and in the modern setting of the Settimo Senso Restaurant, created in the new wing.